We can handle most types of suspension repair at J A Car Services. If your vehicle isn’t handling as well as it used to, bring it over to us and we will take a look at it for you. 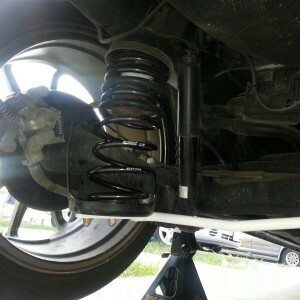 Apart from the odd broken coil spring some suspension problems can creep up on you with gradual wear so it’s always a good idea to have your suspension looked at. Some suspension problems can result in issues such as aquaplaning where your tyres are not forming enough contact with the road surface. Any play or uncontrolled motion in these systems can also result in a deterioration of handling and accelerated tyre wear. Vehicle alignment is closely tied to the condition of the suspension and steering systems. Worn or loose components affect the suspension systems ability to control motion and alignment angles, resulting in a deterioration of vehicle handling and stability, and accelerated tyre wear. The primary function of your cars suspension and steering systems is to allow the wheels to move independently of the car, while keeping it “suspended” and stable. Think you have steering or suspension problems? Besides pulling and bouncing, signs include uneven or excessive tyre wear and poor steering control. If you notice any of these symptoms, or if you have questions about steering or alignment, please contact J A Car Services.